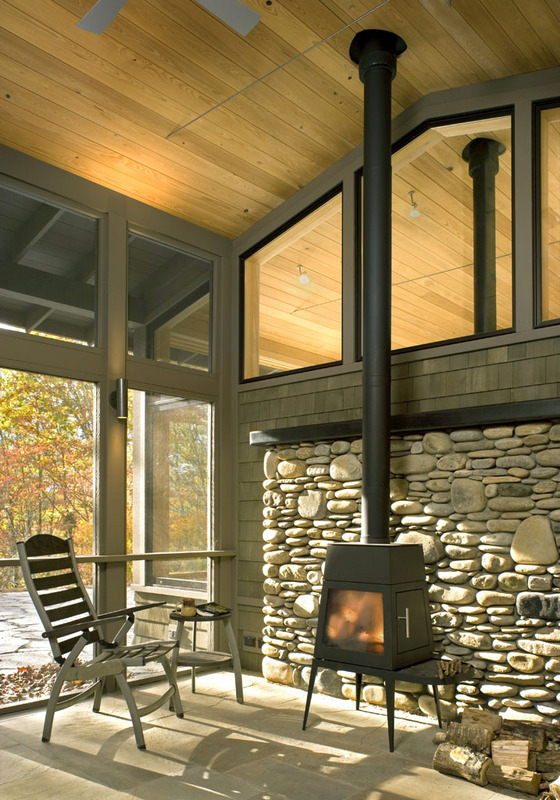 A mountain home is gracefully sited to work with the topography and with the needs of its neighbors. 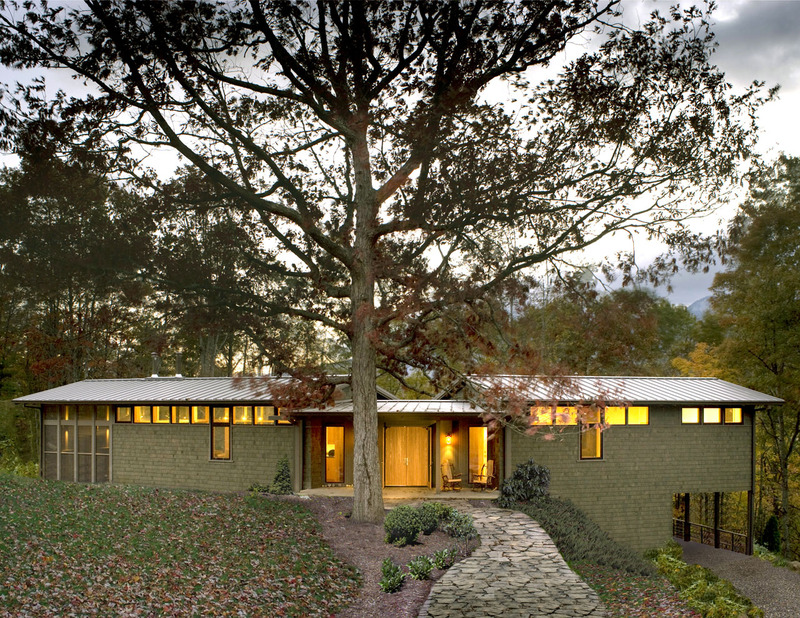 Located downslope from a steep ridgeline in the Blue Ridge Mountains, this month’s featured green home was selected because of its respectful and diligent site placement, conscientious construction process, energy- saving features, water conservation features, and use of regional materials. 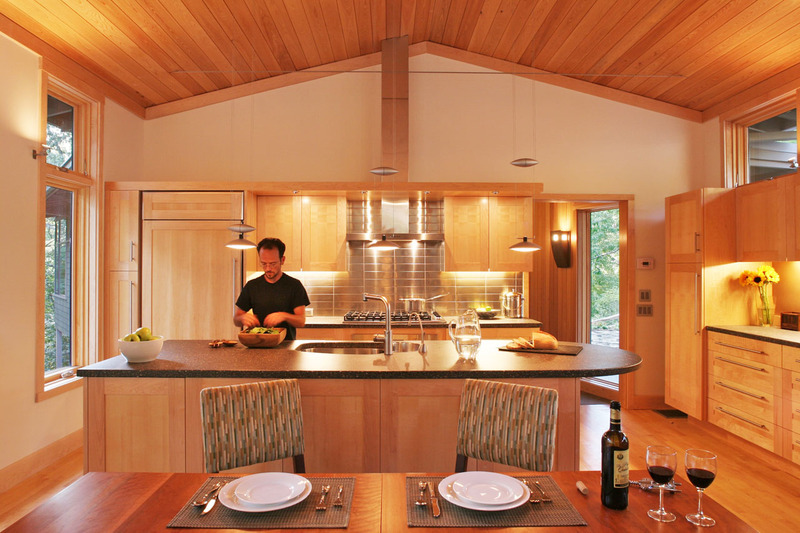 According to Duncan McPherson, the lead architect on the project with Samsel Architects, environmentalism was an integral part of the design process, and the outcome was truly a collaborative effort between the firm and the homeowners. In order to avoid disrupting the water and soil quality of the nearby farm and to preserve scenic views within the community, the homeowners opted not to build directly on top of the ridge. After evaluating three potential sites on the property, they chose to build the home downslope of the ridge, along a tree line, which allowed for privacy and protection against wind exposure. 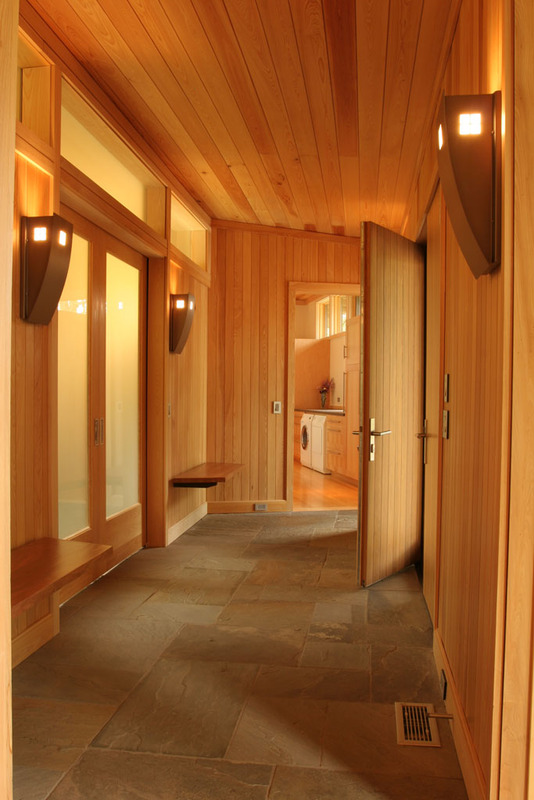 According to McPherson, Samsel Architects builds energy-efficiency measures into every project. However, the extent of the products, technology, and systems used ultimately comes down to the mindset and budget of the client. After evaluating a multitude of options and recommendations, the owner chose to use Icynene (a water-based, open cellulose expanding foam) on the walls, in the basement, and on the roof. “This product does a great job of air sealing the envelope, controlling moisture, and preventing mold,” says McPherson. The firm also specified low-e windows and doors to reduce heat gain and loss, a high efficiency air-to-air heat pump to minimize the energy load of the HVAC system, and a dedicated fresh air intake system with a damper to prevent cold air from coming directly into the home. McPherson explains that the intake air goes directly into the heating and cooling system, which not only helps to save energy but also results in better indoor air quality. 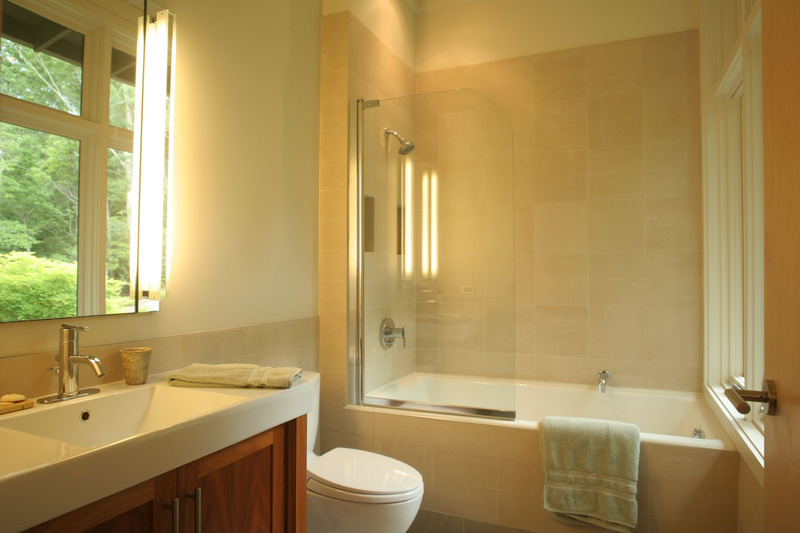 Other energy-saving features included low-voltage lighting to reduce energy demand and high glass windows, which provide abundant ambient light and reduce electricity usage, throughout the home. Since the home was to be utilized as a retreat, rather than as the owners’ primary residence, it was important for the team to choose long-lasting, durable exterior materials that require minimal maintenance. 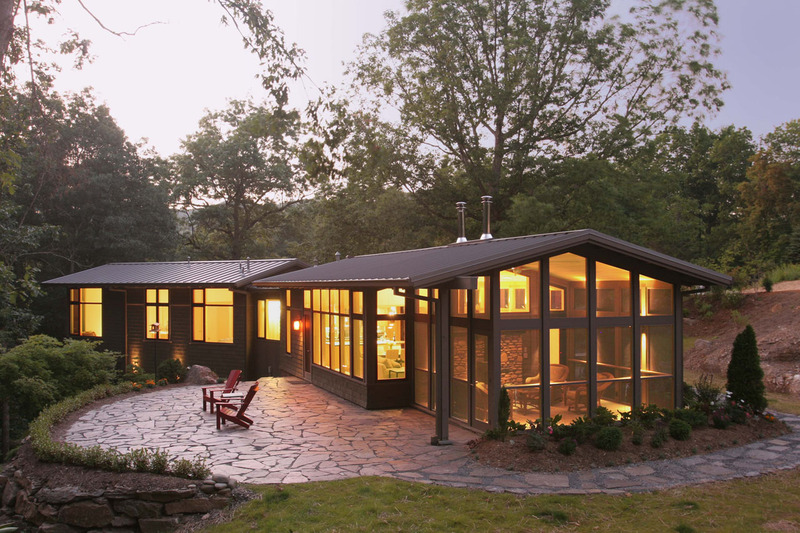 To this end, they chose FSC-certified Eastern white cedar shingles, fiber cement lap siding, and metal roofing that contains an average of 25% recycled content. 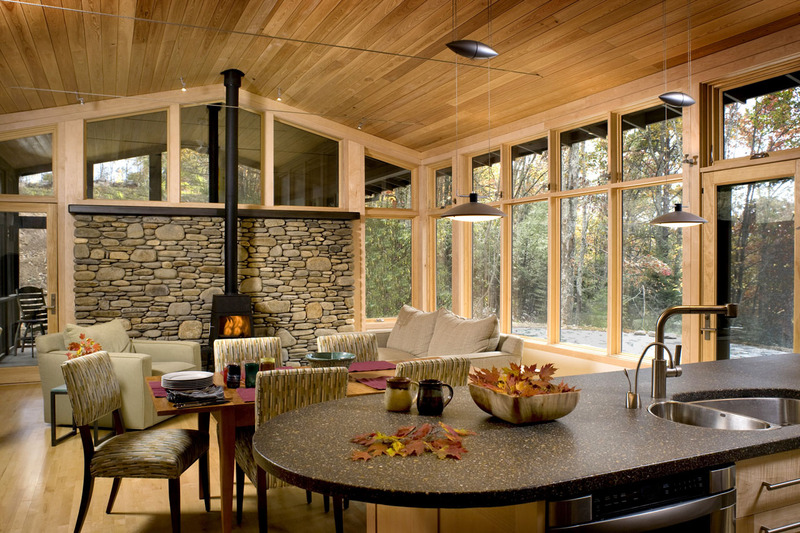 Inside the home, the owners chose to work with materials that not only complemented the design aesthetic of the retreat but also were also manufactured within the region. According to McPherson, the cabinets, woodwork, stone, concrete countertops, and some of the furniture came from local or regional resources. For example, the aggregate in the concrete kitchen countertops was made from river pebbles that a local craftsman had obtained from a dredged river. 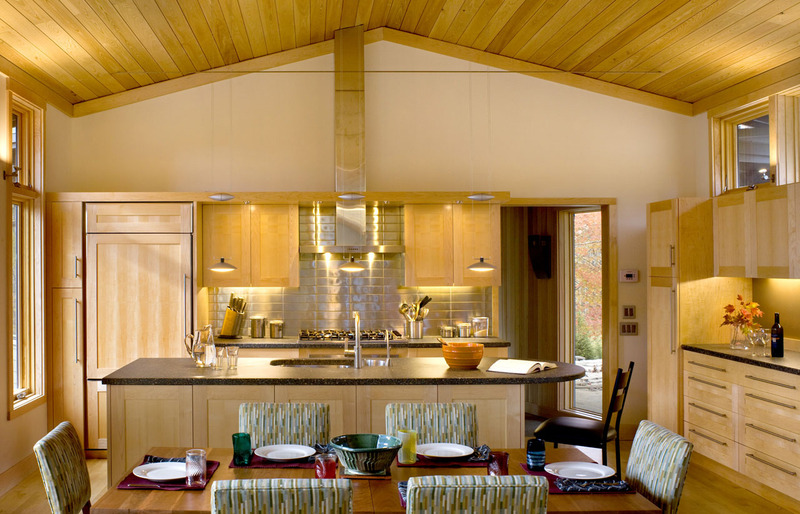 Other regionally sourced materials include cypress (in the ceilings) and maple (in the floors, cabinets, and window trim).